Trade Dollars are just like cash and for that matter are based on regular currency. One US Dollar = One Trade Dollar. Trade dollars are a unique form of currency that give your business buying power in our network of over 16,000 participating IMS member trade companies. It’s important that your trade dollar is well respected and stable. To ensure the value of your trade dollar, the system that they reside in must be economically stable and properly managed. 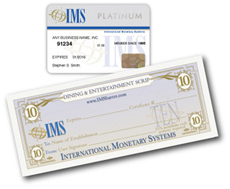 IMS provides that system! For more than 32 years IMS has dedicated itself to building the IMS Barter ecosystem. We have steadily grown the network through expansion and acquisition and know what it takes to ensure the long-term stability of a trade network. Our experience and expertise guarantees that trade dollars earned will retain their value. As long as you remain a member, your trade dollars never expire, never lose value or buying power. To learn all the benefits of becoming an IMS member visit our membership information page. If you’re ready to start saving cash, join today! I love barter and my kids love it. The first year barter was a little scary for me, thinking that it was not working out. I wasn't good at it like I am now. I didn't know all the avenues - how to spend it. Into my second year I was getting better and better at it, and now we spend faster than I can make it.